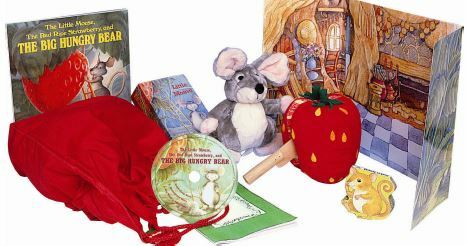 Find out together how the Little Mouse keeps that Red Ripe Strawberry from the Big Hungry Bear with this wonderful story kit. You can have the children read-along with the CD, follow along with the dramatized version or have everyone sing the Big Hungry Bear song. The book, written and illustrated by Don and Audrey Wood is a classic. Children love the Little Mouse plush and the big Velcro strawberry that you can cut in half with the wooden knife – perfect for sharing and safe for little hands. • Pocket Mouse board book, & Teacher/Parent Guide.